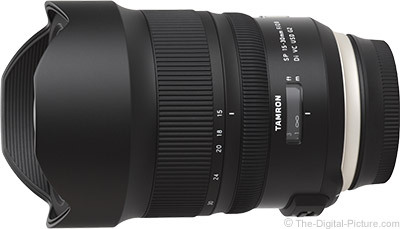 Image quality test results have been added to the Tamron 15-30mm f/2.8 Di VC USD G2 Lens page. Here is the Tamron 15-30mm f/2.8 VC G2 vs. G1 Lens image quality comparison. Obviously, the camera resolution is quite different in these results, but if you visualize the chart details in the G1 results being enlarged to the G2's detail size, you will likely determine that these two lenses perform very similarly. That they perform similarly is not a surprise. Rent the Tamron 15-30mm f/2.8 Di VC USD G2 Lens from Lensrentals. While it is always great to photograph a beautiful sunset, better is to find a way to create sunset images that are different from the hordes of others in my archives. 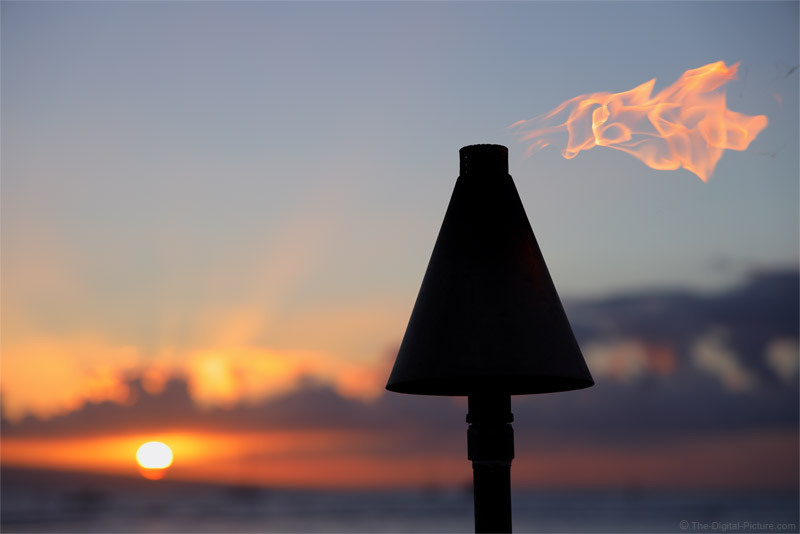 A silhouette often makes a good sunset image differentiator, adding a little something to the image, and in this case, a tiki torch hints at the location the image was captured at. Note that sunsets do not always have to be in focus. To mix things up a bit, I decided that I wanted the tiki torch and its flame to be sharp with the background going out of focus. Thus, a wide aperture was selected. The wide aperture had the secondary purpose of enabling a flame-freezing shutter speed. The composition decisions for this image were made primarily for overall balance in the frame. The tiki torch is dark and heavy, so placing it near the center was helpful for balance. I wanted the torch flame in the frame along with the other flame, the sun, along and the color surrounding it was another subject of primary interest. With the latter seeming stronger than the prior, moving the tiki torch slightly to the right seemed to make sense. Keeping the perimeter of the frame clear of lines often helps keep the viewer's eye in the frame. As the flame was changing rapidly, I captured a burst of images and later selected the flame shapes I liked best. The Canon EOS R and RF 24-105mm f/4L IS USM Lens are a perfect walkaround combination. The camera and lens used to capture this image were on loan, but I eventually added this pair to my personal kit. We’ve been hard at work on Luminar 3 and we’ve got a significant update to share with you. With Luminar 3.1.0 you’ll find several new improvements for both Mac and Windows. The next generation of Accent AI makes enhancing your images easier than ever before. Plus some performance and usability enhancements will make your editing workflow even faster. The improved Accent AI filter lets you get natural-looking results in less time. New “human-aware” technology recognizes people in your photos and applies adjustments selectively for more realistic images. With Accent AI 2.0, you can make dozens of adjustments (done quickly) with just one slider. Fix tone, detail, exposure, depth, color, and more thanks to behind-the-scenes AI. In less than a second, your photos can look their absolute best. Make Accent AI 2.0 your go-to filter. (Tip: It can even replace the Develop step for most photographers!) For beautiful photos, rely on Accent AI 2.0 as your starting point. Whether you’re working with the Library to organize your images or using the QuickEdit command, it’s now even easier to get the results you want. Take advantage of image-aware filters and professionally designed Luminar Looks to unlock the best image possible. Once you’ve created the perfect style, apply it to all shots in your series with the improved Adjustment Sync. You can now select multiple photos and apply the same adjustments in just one click. Filters and Looks are transferred in just one click, while image-specific changes like cloning and cropping are ignored. RAW shooters can stay organized. If you capture RAW and JPEG at the same time, it’s even easier to stay organized in Luminar 3. When you import RAW and JPEG pairs, you can decide which files to see. View just RAW or just JPEG for a less cluttered library, or see both and use the JPEG file as a reference while you edit. Edits to JPEG and RAW files are independent but can be easily synced. Use the View menu to control which images are shown for a clutter-free library. Using the Gallery view to get organized or search for that perfect image? Now when you sort using a method like File Type or Color Label, a second organization is also applied. When you sort your images they are sorted by the new category first and then automatically sorted by date. Trust your editing to Luminar. Thanks to our users for reporting different issues. This version of Luminar offers general stability improvements. We’ve made hundreds of under-the-hood performance improvements based on user feedback. Windows users, in particular, will see tons of new features that bring Luminar for Mac and Windows into close alignment. Improved stability and performance along with robust catalog backups help keep your images and edits safe. SMUGMUG SHARING. The ability to post images to SmugMug has now been added to Luminar for Windows. SHORTCUTS. Folders and user albums can be added to the Shortcuts list. Just right-click for a context menu or drag & drop them into the list. IMPROVED SELECTIONS. Want to choose a range of photos in the Gallery view? Try the Shift or Ctrl key to select a range or group of images. You can also deselect images from a multiselection by Ctrl+clicking on an image. ROTATE IN GALLERY. Images selected in the gallery can be quickly rotated left or right by 90 °increments with no need to switch to edit view. Just use the Image > Rotate menu or just right-click. PHOTOSHOP ELEMENTS SUPPORT. We’ve added Photoshop Elements support to the Windows platform. Just choose the Install Plugins command if you want to load Luminar as a plugin. For future versions of Luminar, plugin users should switch to Luminar Flex. IMPROVED HISTORY. Undo a Sync/Copy/Paste adjustments with one step in the History list. HIDDEN FILES. Luminar does a better job of filtering hidden folders and photo. Additionally, unwanted items like Backups, History, Previews, and Caches won’t be shown when opening Luminar Catalogs. Several performance improvements, as well as new features, await Mac users. We hope you enjoy this new release of Luminar and appreciate your feedback and reports. PROGRESS BAR. Keep better track of what’s happening when working with Luminar. You’ll see a progress bar when using tools like Erase or when running Luminar as a third-party filter. Updating your Luminar software is easy. Be sure to also rerun the plugin installer if using Luminar as a plugin for Photoshop or Lightroom Classic. Mac – Please, launch Luminar 3, then in the Top Menu Bar choose Luminar 3> Check for updates. Windows – Please, launch Luminar 3, then in the Top Menu Bar choose Help > Check for updates. Use coupon code THEDIGITALPICTURE to save $10.00 on a Luminar 3 purchase. We would like to share results of our investigations regarding the operating conditions of the Sony “a6400 (ILCE-6400),” released by Sony Corporation on February 22nd, 2019, and SIGMA’s interchangeable lenses for Sony E-mount. With the SIGMA’s interchangeable lenses for Sony E-mount, both the AF and the AE work inter-connectedly, and they are compatible with the in-camera Lens Aberration Correction function:“Lens Correction” (“Peripheral illumination correction”, “Chromatic aberration of magnification correction”, “Distortion correction”). *SIGMA 19mm F2.8 DN | Art, SIGMA 19mm F2.8 EX DN, SIGMA 30mm F2.8 DN | Art, SIGMA 30mm F2.8 EX DN, and SIGMA 60mm F2.8 DN | Art are not compatible with the Fast Hybrid AF. In addition, we found some phenomena particular to some products listed below. Regarding these phenomena, we are going to release a firmware update for improvement. The availability of the firmware will be announced on a later date. Furthermore, the operating conditions of SIGMA’s SIGMA GLOVAL VISION (SGV) lenses via the MOUNT CONVERTER MC-11 are currently under investigation. After completing it, we are going to make an announcement. The stop position may vary when the shutter button is repeatedly half-pressed on the AF toward the same subject. With a6400 and cameras incorporating DMF mode, it automatically displays a magnified view as it gets in focus, when using the AF while the MF assist function is turned on. In this video, photographer Lindsay Adler demonstrates three techniques for using V-flats for beauty lighting. April 25, 2019, Commack, NY - Tamron announces the launch of a new zoom lens, the 35-150mm F/2.8-4 Di VC OSD (Model A043), for full-frame DSLR cameras. Photographers everywhere, especially those who enjoy photographing people, can add wider range to their creative expression with the new Model A043 that extends from 35mm to 150mm and offers a fast F/2.8 aperture at the wide-angle end while maintaining a bright F/4 at the telephoto end. The lens will be available May 23 in Nikon mount and June 20 in Canon mount at approximately $799 at authorized Tamron USA retailers. The zoom range incorporates the 85mm focal length (often regarded as optimum for portrait shooting) and covers everything from full-body shots that include the surrounding environment to head-and-shoulders shots that stand out from a natural defocused "bokeh" background for which Tamron is renowned. The compact Model A043 is designed for fast handling and easy transport, measuring only 4.9 in long and perfectly balanced. On the technical side, three optimally placed LD (Low Dispersion) glass elements and three hybrid aspherical lenses quash various optical aberrations. Autofocus is exceptionally quiet with improved precision and speed thanks to the OSD (Optimized Silent Drive) DC motor. Furthermore, the Model A043 incorporates the Dual MPU (Micro-Processing Unit) system, which strikes the perfect balance between AF performance and effective vibration compensation. For close-focusing, the MOD (Minimum Object Distance) is 17.7 in across the entire zoom range. Providing greater flexibility when used outdoors, a Fluorine Coating and Moisture-Resistant Construction deliver extra measures of protection. The new 35-150mm portrait zoom is the most useful and most creative lens a portrait photographer can own. Chromatic aberration and other imperfections that can diminish and degrade resolving power are thoroughly controlled by an optical design that combines three high-performance LD (Low Dispersion) glass elements with three hybrid aspherical lens elements aligned in perfect balance. The result provides the high levels of sharpness and contrast that today's high-resolution digital cameras require. Tamron's exclusive formula is optimized for exceptional performance around the mid-zoom 85mm range because that focal length has long been regarded as the preferred choice for portrait shooting. True to its designation as a "portrait zoom," the Model A043 leverages Tamron's optical technologies across the entire zoom range from wide-angle to telephoto to assure the finest experience at any setting. Making full use of the controlled depth-of-field properties only fast-aperture lenses can provide, Tamron employed proprietary simulation technologies to maximize the soft and natural "bokeh" defocused blur it has cultivated over many years. As a result, in-focus areas are rendered sharp and crisp down to the fine details that makes the subject stand out against a gently and beautifully blurred background. This technique is highly prized by portrait photographers and is potent for virtually every other type of photography. Tamron's legendary BBAR (Broad-Brand Anti-Reflection) Coating works in harmony with an optical design that suppresses internal lens reflections to significantly reduce all traces of ghosting and flare. Because portraits are often shot under backlight conditions for impact, Tamron uses these advanced technologies to preserve high image quality even when strong sources of light-including the sun-are in frame. Silent autofocus driven by OSD (Optimized Silent Drive) DC motor - The OSD DC motor debuted in the 17-35mm F/2.8-4 Di OSD (Model A037) with favorable response. OSD technology reduces drive noise significantly (compared to previous DC motor-equipped lenses) while boosting autofocusing precision and speed by a wide margin. This eliminates noisy distractions during portrait shooting. Furthermore, the superior AF precision also provides more accurate tracking when locked on moving subjects. Outstanding VC (Vibration Compensation) - Tamron's original VC system is enhanced in the A043 with an independent MPU dedicated to image stabilization without detracting from AF processing functions. Consequently, the VC (Vibration Compensation) achieves 5 stops*, according to CIPA Standards. This is highly beneficial when shooting at the telephoto end where camera movement is magnified. It's also very valuable when shooting at slow shutter speeds in dim lighting conditions. Close focusing, the A043 delivers an MOD of 17.7" at all focal lengths thereby expanding versatility and creative freedom. This allows portrait photographers to get in close to capture expressions and smaller details and allows them to adjust camera-to-subject distance with greater control. Even when shooting indoors where movement is restricted, users can make use of this feature to find the perfect shooting position and angle. Tamron has applied magnificent craftsmanship to a beautiful, intuitive design to produce a zoom with superior look and feel. From the outer contours of the lens, to the deftly worked Luminous Gold brand ring, the quality of this lens is second to none. Even details like the shape of the switch box and the precision and stability of the metallic mount reveal a commitment to functionality as well as design. The surface of the front element is coated with a protective fluorine compound that has excellent water- and oil-repellant qualities. The front surface is easier to wipe clean and is less vulnerable to the damaging effects of dirt, dust, moisture or oily fingerprints, allowing for much easier maintenance. The new Model A043 is compatible with the TAMRON TAP-in Console, an optional accessory product that provides a USB connection to a personal computer for easy updating of the lens's firmware as well as customization of features including fine adjustments to the focus position of AF and VC control. For the discerning travel photographer who wants to pack light while maintaining excellent image quality, the new 35-150mm zoom pairs perfectly with Tamron's 17-35mm F/2.8-4 Di OSD (Model A037) wide-angle zoom. The two lenses together cover 17mm to 150mm affording creative and versatile capture of landscape, street scenes, architectural details, food, street portraits and more, at a total weight of just 44.1 oz* with fast F/2.8 at the wide ends and F/4 at the tele end of each. * Weight applies to the model with the Nikon mount. 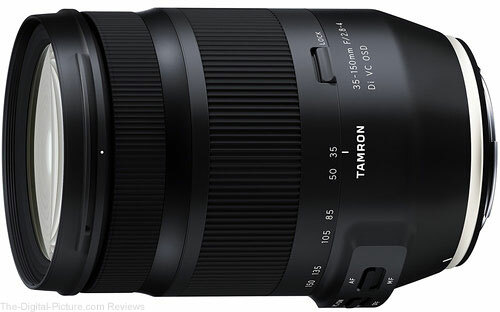 B&H has the Tamron 35-150mm F/2.8-4 Di VC OSD Lens available for preorder. For wildlife photography, timing, in a variety of ways, is critical. The time of the year is one timing factor. 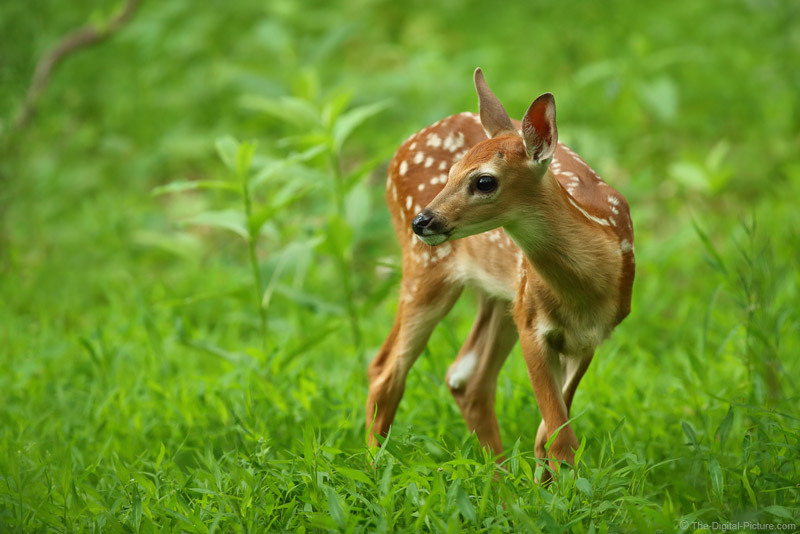 In Shenandoah National Park, spring brings bright green foliage and these adorable whitetail fawns. Another timing factor is where the animal is at the moment it is photographed. That timing involves determining (guessing) where the animal is going next, determining an ideal photo position in that path, being the right distance away for framing and composition purposes, and being ready when (OK, if) they get there. This time, the timing worked and this image of a fawn against a bed of green was the reward. Often, wildlife looks best when photographed with a camera that is level for both tilt and roll. The tilt part means getting the camera at the animal's level and when the animal is small (and not at a higher elevation than you), that means getting down low. Photographing from a low position is not always the most comfortable, but the effort is usually worth it and the images taken with a downward angle are often deemed not good enough after some level captures are on the card. In this example, the low green foliage permitted a level position, but a compromise is sometimes needed if visual obstructions become an issue. Fawns are constantly moving and a monopod lets me adjust the height very quickly while trying to photograph them. There is still room for you on the "Whitetail Fawns and Much More", Shenandoah National Park Instructional Photography Tour. All skill levels are welcome! Canon has released its financial results for 1Q 2019. You can download the results, presentation material and speech summary here. 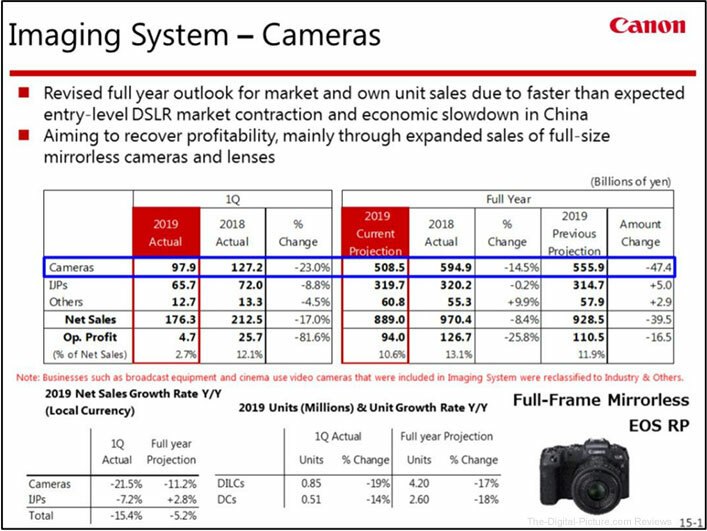 It seems that the camera market decline is occuring at a higher rate than Canon initially projected. At the very least, it appears that we have six new RF lenses to look forward to before the close of 2019. Although developed for 35 mm full-frame cameras, the Otus 1.4/100 gives you the quality and look of a medium-format system. 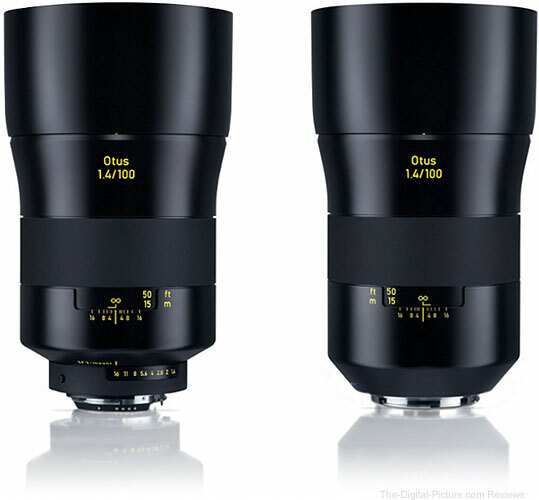 The lens is expected to be available for preorder at B&H and Adorama. In this Photoshop Magic Minute, Meredith Stotzner uses the Refine Edge Brush to pull in edge details like fur and hair. 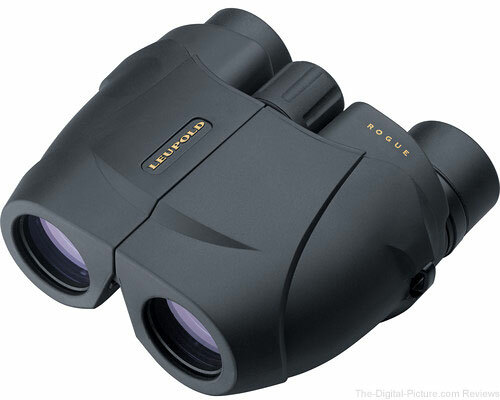 B&H has the Leupold 10x25 BX-1 Rogue Compact Binocular available for $64.99 with free shipping. Regularly $99.99. 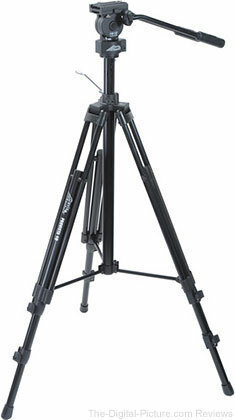 Through midnight tonight Eastern Time, B&H has the Davis & Sanford ProVista Tripod with FM18 Fluid Head available for $99.99 with free shipping. Regularly $159.99. Unless you are a local, Bowers Beach in Bowers, DE, referred to as sleepy fishing village (population about 335), is probably not on your radar. That this town and beach border the Murderkill River, north of Slaughter Beach, surely does not help spur interest. Exploring with a camera is one of my favorite things to do and late on this day, I ended up on the very peaceful Bowers Beach at low tide. 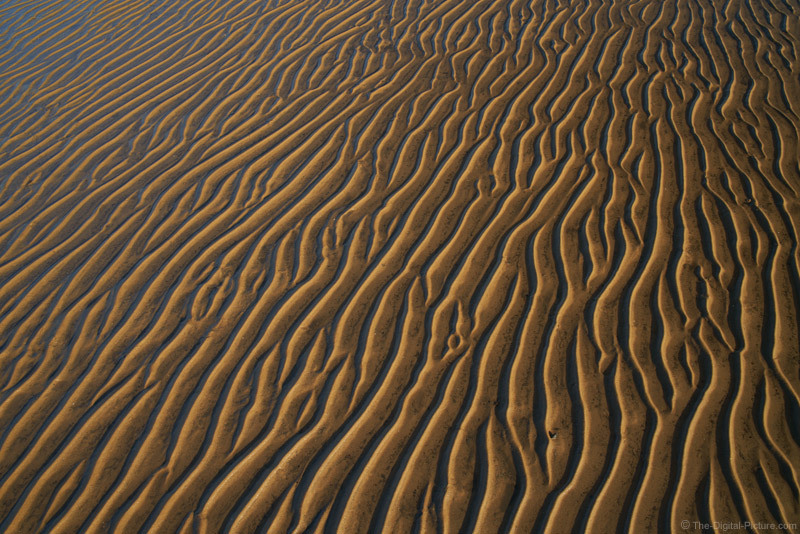 With the Delaware Bay drawn back, the low angle light emphasized the ripples left in the sand. Those ripples consumed my attention for the last hour of direct sunlight. The Tamron 28-75mm f/2.8 Di III RXD Lens mounted on a Sony a7R III were perfect for walking around the beach. For each image, I selected an aperture that would keep all details in the frame sharp (commonly f/11) and focused roughly 1/3 into the depth of the image. I varied the focal length, the camera height, and the camera's up/down angle while trying out a variety of ripple locations on the beach. When the right set of ripples are found, there seems to be endless compositions available. That of course creates a selection challenge during post processing. For this set, I simply picked one image I liked and archived the rest of the RAW files. Images of patterns are seldom among my most-liked social shares, but ... I love them. They are great for interior decorating and they work very well as backgrounds for various media. Today, Amazon is featuring select PC Components and Accessories as a Gold Box Deal of the Day. 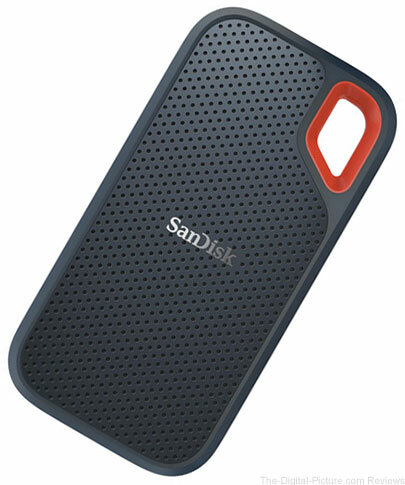 Discounted products include processors, power supplies, RAM, fans, computer cases, wireless routers, mice, keyboards and portable hard drives (like the SanDisk 2TB Extreme Portable External SSD, an especially good deal). The camera sometimes had trouble focusing on subjects in the focus points at the edges of the frame. The camera would sometimes stop responding during shooting in continuous high-speed (CH) release mode. The camera would sometimes not turn off after the power switch was rotated to “OFF”.